Casquette is French for cap. In cycling jargon, it is used to refer to the traditional peaked cotton cap worn by racing cyclists. 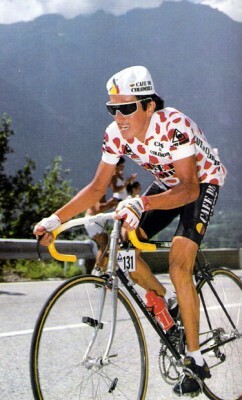 With the introduction of compulsory cycle helmets for massed-start racing, casquettes have become less common, but most professional race outfits still have them produced in team colours for wearing on the winner’s podium, for wearing under a helmet in heavy rain or for sale to the tifosi. They have also become popular as fashion items in some American cities, often with non-cycling-related designs. The casquette shields the head from strong sun and the peak can also make riding in the rain more comfortable, since drops do not fall directly into the eyes. They are sometimes worn with the peak backwards, not for reasons of fashion but because the peak then protects the neck from sunburn. A traditional way to keep the head cool when cycling in hot conditions was to put a cabbage leaf under the casquette.